If you have tried every over the counter remedy, as seen on TV product, and undergone countless professional treatments for fragile or thinning hair, we have the solution that is right for you. The first thing that you need to realize is that there is no such thing as a one-size-fits-all solution. We start each relationship with a new client by providing a comprehensive scalp evaluation to identify the underlying cause of damaged hair. Whether you are already experiencing bald spots or just see way too much scalp when you style your hair, our hair loss solutions for women can help. Stop wasting time and money on products that can’t possibly address every situation for women and hair loss. 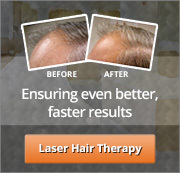 Come to our Greater Boston hair loss clinics and get help once and for all. When it comes to treating Southeastern Massachusetts hair loss in women, our technicians understand that every client is different. The underlying cause of thinning and fragile hair, as well as outright hair loss, can vary from person to person. Your lifestyle, budget, styling needs, and goals will be unique to your situation. This is why we provide custom hair loss solutions for women based on their critera to ensure much more satisfactory results. South Coast Hair Solutions offers professional treatment options to clients from all over the Greater Boston, Cape Cod Southeastern Massachusetts, and Rhode Island area, helping to treat any type of damaged hair problem. There is a wide range of reasons why you might be experiencing hair damage. For some women, genetics play a clear role, causing everything from dry, fragile or thinning hair to serious hair loss. For others, damage could be caused by an external source, such as harsh chemical treatments, grooming, styling, and coloring. However, there are still other clients who come to us after the damage has occurred due to a medical condition or treatment, such as a vitamin deficiency, illness, prescription medication, or therapy. There are three primary types of damage that can lead to Southeastern Massachusetts hair loss in women. You might recognize that you are experiencing one or more of these symptoms. Make sure to speak up and tell our technicians about any damage that you have noticed so we can make a proper assessment of your condition. The more information we have about your background and hair goals, the easier it will be to find hair loss solutions for women that will work with your situation. Our mission is to provide natural-looking, affordable solutions for every client who walks through our door. 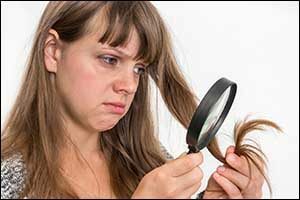 Damaged Hair Cuticles – The result is hair that tangles easily, lacks shine, is unmanageable, and appears frizzy even with smoothing creams and treatments. Hair can feel brittle and rough, even when damage first becomes apparent. Fragile Hair – When damage expands from the hair cuticle to the cortex, which is the part of the hair that is responsible for color, pattern, and strength, the strands are very likely to break or split. This is more than just split ends. Hair can break off in chunks, depending on where the damage is located. Thinning Hair – There are two things that can cause thinning hair. The first is slowed hair growth which can occur all over the head or in patchy areas. The second is excessive fallout, which can be caused by a number of different situations. Stress, medical treatments, hair pulling disorders, and even genetics can play a role here. Commercials on television tell us 24/7 that all we need is the right conditioning treatment and we will look like the Rapunzel-esque models on magazine covers and billboards. The truth is that a lot of those hair models use hair loss solutions for women themselves. Our Greater Boston hair loss clinics serve a wide range of clients, including models, beauty pageant contestants, actresses, and professional business women. We also help stay-at-home soccer moms, teachers, caregivers, and just about anyone who wants to look their very best. Solutions for men are much more common, as people don’t want to talk about women and hair loss. It’s time to take charge of your life and find the treatment option or product that is best for you and your unique situation. South Coast Hair Options can get you immediate results for damaged, fragile and thinning hair. Our hair solutions for women include UltraTress II, UltraStands, and UltraLinks top quality human hair extensions made from 100 percent Remi Human Hair in 30 natural colors. We also work with Virtuesse restoration solutions, which were devised to help women who cannot use hair extensions. Are you interested in learning more about our hair loss solutions for women? Give us a call at 508-995-7085 or visit our Greater Boston Hair Loss Clinic on Acushnet Avenue in New Bedford, MA. Conveniently located to serve the needs of the South Coast region, you can count on South Coast Hair Options to find the solution that is best for you!